About 25 percent of women who use birth control choose oral contraceptives. (CNN) -- A woman's monthly period could be a thing of the past now that the government has given the green light to a new oral contraceptive called Seasonale. Seasonale, approved by the Food and Drug Administration on Friday, would reduce the number of women's periods to four a year by taking the hormones generally found in conventional birth control pills, but for longer spans of time. Seasonale would be another alternative for women seeking birth control, said an official with the pill's manufacturer, Barr Laboratories. "For women who desire prevention of pregnancy and are comfortable taking a hormonal contraceptive, then this gives them an option," says Dr. Carole Ben-Maimon, president and COO of Barr Research. "We see it as a [choice] for those wanting the convenience." First introduced in the 1960s, the most common birth control pills combine the hormones estrogen and progestin for use for three weeks followed by a week of placebos to allow a woman to have her period. Seasonale, however, uses the same types of hormones but for 12 weeks straight before a week of placebos. Not having as many periods -- and the medical problems surrounding them -- has some women intrigued. Kelley Barclay joined more than 1,400 women in a clinical trial of Seasonale because her monthly period plagued her with cramps, mood swings and pain. "My mood swings were not at all like they had been before, not at all severe, and my pain was not at the level that it had been before I started Seasonale," she explains. Almost 39 million women in the United States use some kind of birth control, according to the Kaiser Family Foundation. The most common reversible method is oral contraceptives, in use by an estimated 25 percent of women who use birth control. The technique of taking birth control pills continuously to keep from having a period isn't new. For instance, Dr. Carolyn Westhoff, an obstetrician-gynecologist at Columbia Presbyterian Medical Center in New York, has been using regular packs of birth control pills back-to-back to skip her period for about 10 years. "It's really terrific not to have the bleeding, not to have the cramps, not to have some of those symptoms that lead up to a period," she says. "And I think many women will be really eager to trade in 14 a year for four a year." Westhoff, not associated with the clinical trials, had said she would prescribe Seasonale to her patients if it won FDA approval. "Using Seasonale, ... I think mainly is going to add a lot of convenience for women and freedom from the symptoms they have with their periods." But Dr. Susan Rako -- author of "No More Periods?" -- argues that there are good medical reasons for a woman to have a period. "Bleeding is the only way our bodies can rid themselves of excess stored iron, and excess stored iron is another risk factor for heart attack and strokes," Rako says. "And that's why in their menstrual years, women have fewer heart attacks and strokes than men." Rako said other issues are raised, too, when considering period suppression. "We're not just talking about doing away with menstruation," she says. "We're talking about doing away with women's normal hormonal menstrual cycle, which is really responsible for what fundamentally makes a woman a woman." Barr's Ben-Maimon says that Seasonale is as effective at preventing pregnancy as other oral contraceptive products. 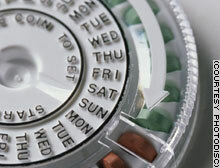 The failure rate for traditional birth control pills is around 1 to 2 percent with perfect use, according to the FDA. Some women should not use birth control pills, including those who smoke cigarettes, particularly if they're older than 35. There is a slight increase in risk for blood clots and high blood pressure.